Well, there isn’t a day that goes by that I don’t get at least a few hits on the site for people looking for what the ‘best’ storyline in Star Wars The Old Republic is. It’s a tricky subject matter because it is almost entirely subjective. What does someone define as ‘the best’? It’s like all those people who claim that the game isn’t “Star Wars”-y enough but can never actual explain what the hell that means. And while all the reviews aren’t finished yet, I have indeed played through every single class story at this point. So I might as well give people what they keep asking for. 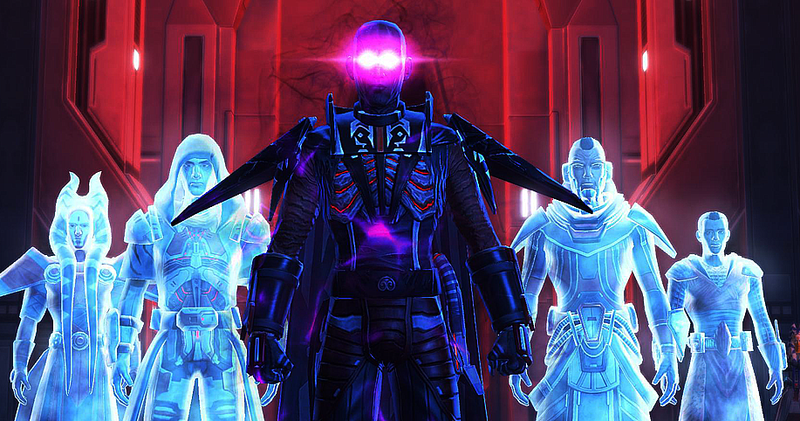 This is my personal Worst to Best Class Storylines for Star Wars: The Old Republic. Anyone who has read my review for the Trooper should not be surprised to find this at the bottom of the list. The problem is just that the entire Trooper story pretty much ends with Chapter One. Chapter Two and Three feel like filler. There’s nothing built up to them. There’s nothing tying them together. Chapter Two is a horrific abomination of sheer pointlessness and Chapter Three does very little to improve on that already low bar. On top of that, these two very bland chapters then go out of the way to try to paint your character as the instigator for the renewed war. Not just that the war has begun while you were fighting like some other class stories. No, that the Empire has renewed it’s attacks directly on the Republic as immediate retaliation for your actions. Granted, it might just be an excuse but damn is that being thrown under the narrative bus. The shame of the whole thing is that the prologue and first chapter are actually really solid and I would actually recommend playing through them. But once you get to level 30 and start Chapter Two the whole story takes a hard nose dive and never truly recovers. The Inquisitor is a classic case of biting into a Peanut Butter Cup and finding it filled with Cookies & Creme filling instead. It might not be bad, but it sure as hell isn’t what you signed up for. Look anywhere for what the Inquisitor is pitched as and you’ll find comparisons to the subtle machinations of Palpatine, manipulating forces into completing your ends, and being a grand puppet master with all the powers of the dark side at your beck and call. What you actually get is more akin to Indiana Jones in space. You find relics, pursue ghosts, and end up using more magic in this space opera than your average D&D game and the Mass Effect 3 ending combined. In other words, it doesn’t deliver on what’s promised. In fact, it rarely even tries to. It goes off in some completely different direction and then shouts back at you that it doesn’t know what your problem is, this is the way it always intended to go. Of course, that’s not what puts the Inquisitor so low on this list. Not alone at least. No, the real reason this one got marked down so much was quite simply that it spends so much time painting your character like a complete and utter idiot. You walk in traps, blindly trust those who clearly are trying to kill you, and routinely must be saved by a third party to avoid certain death. None of these are a result of your choices or actions either. These just happen to you regardless. Then somehow you get a seat on the Dark Council out of all of this. Talk about fricking failing upwards. I honestly can’t play through the Inquisitor story without feeling that the game is actively insulting me at times. Let me just say this, because I know some of you are reading this and saying ‘Didn’t Vry like the Consular in his reviews?’ I adored the Consular… Once the plot actually got started. 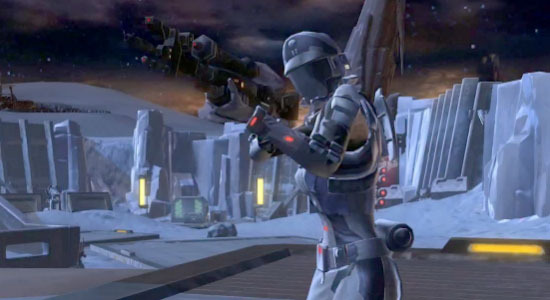 Honestly, the Consular is almost the antithesis of the the Trooper. The best stuff comes after Chapter One. The downside is that those first 30 levels? They can be nightmare of tedious repetition. The same tasks over and over with only slight changes. Chapter One at least has the mystery element to it, but you can only really appreciate the mystery once you reach the end and can see all the threads connecting things. But honestly? If I wasn’t writing a review for this website, I don’t think I ever would have made it out of Chapter One. Hell, I don’t know if I could pull of getting past the prologue. But if you can do that, then you are in for an amazing story about galactic diplomacy, building alliances, and commanding your own personal army to do battle against an enemy that could literally be anyone. It sometimes feels a bit more like Star Trek instead of Star Wars, but that’s okay. It’s different and in a good way. 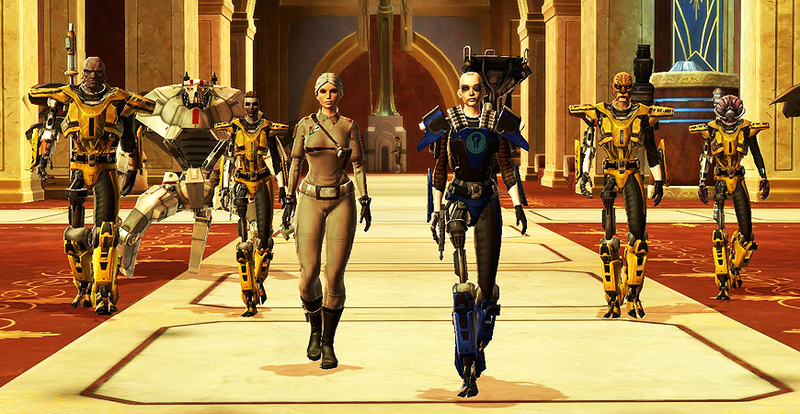 By the end of Chapter Three, your Consular has done more to preserve the Republic than any other class. So yea, the first two parts of the story knock this one pretty far down on the list, but don’t think that it is by any means a terrible story once you wade through the boring parts. Especially with the 12x XP thing going on, now is really the time to see where the Consular shines cause you can get through the boring crap in a day now. Oh Bounty Hunter, I do adore thee. Probably one of my own personal favorite stories. I just like the flavor. So why is it only at number 5? Well, probably because it is a straight-shot, middle of the road, nothing terrible but nothing blow your mind away amazing story. It’s solid, with no doubt. But there aren’t many instances I can look back and go – yea… that was f***ing awesome. But there’s also nothing I can point to you and say “this completely sucked”. It’s an average story that will be made better if you like the concept of a bounty hunter or mandalorians. Which I do. The Sith Warrior is another example of a very solid narrative that has no real hitches in it that I can look back at and wail about and it would be just another solid middle-of-the-road choice like the Bounty Hunter other than a few shining highlights. Namely, the Corrupting a Jedi Padawan into becoming your apprentice storyline, the sheer amount of information you learn about the Emperor and how he works, and what is probably the best written villain in the entire game. The villain essentially does everything that the bad guy from the Inquisitor story wants to do, but without constantly having to make your character look incompetent to make the villain look more menacing. I described the Sith Warrior in my review as the quintessential Sith experience, and I stand by that statement. If you ever wanted a taste of being Darth Vader would be like, then look no further. You’ll find no problems here. If there were three words to describe the Smuggler story it would be: Silly. Fun. Adventurous. The story is full of laughs as you roam across the galaxy dealing with the back alley scum that no other class gets nearly as much access to. Pirates, shady deals, backstabs, all mixed with a hefty dose of charm and chuckles, this is THE story for a good time. The best part is that it actually does a great job at telling a pretty grand story that ends up turning into something much larger by the end. If there was something I could say that was shining about the Smuggler that puts it so high on the list it would be that the story just snowballs itself down a mountain. It starts small and simple and then builds in both size and momentum, but instead of just becoming a bigger narrative in terms of scale it actually builds on what has come before. Chapter One is an excellent example of this when by the end of it you’ll look back at the events of the Prologue and see exactly how much of it was actually spent setting things up that you probably didn’t even think twice about. The story also shares some traits with our #1 on the list in that several story elements actual vary wildly depending on your light and dark choices. Another reason the story feels so much more alive than many of the others on this list. What do you think of when you hear the name ‘Star Wars’? Brave heroes struggling against an impossible enemy? Epic battles waged across planets? A showdown between the forces of Light and Dark? The Jedi Knight story has all of that. From earning your first lightsaber, to a final duel against the Sith Emperor himself (sort of) I would go as far as to describe the Jedi Knight story as being the essential Star Wars experience. It’s everyone people imagine a Star Wars video game would be like, and hit pretty much hits a ton of the same notes as the Original Trilogy. Straight to the not uptight but wise mentor being killed off only to guide you via force ghost to your next plot point. But beyond the simple Star Wars experience, the Jedi Knight also plays with some of your expectations. What if you became evil? How would those around you react? What about when faced with the moral decision of what to do with your enemies? Your choices early on do help shape the story later. Mostly in flavor, but in rewarding flavor regardless when you get to see so many old faces return to help you in your moment of victory. If you want to play through the epic space opera adventure story, this one if for you. So if Jedi Knight encapsulated the perfect Star Wars story, why is it not at number one? Well because for all it’s solid strengths, the Jedi Knight is a straight forward plot with only flavoring changing based on your choices. What if the whole story changed based on your choices? If the actions you took would have radical different impressions on what rise to power your character had? That may not be the essential Star Wars experience, but that certainly sounds like what we’d expect from a game brandishing the name of BioWare. It’s for that reason that our number one spot goes to the Imperial Agent. 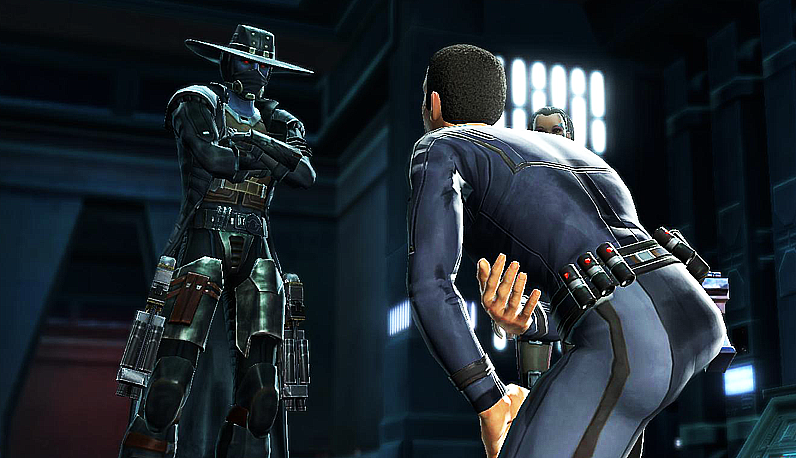 The Agent’s story is not only full of mystery and exciting well done plot twists, but also delivers many of the crucial details of how the story of The Old Republic shakes down. Want to know why the Voss are so brutally neutral? The answer is here. How the hell is the Empire losing the war? The answer is here! You combine that with tons of amazing plot twists that build and build in a massive web of intrigue that reveals the Star Wars equivalent of the Illuminati pulling the strings behind everything? That’s fricking awesome! And oh yes, your choices do matter in the Imperial Agent story. There are THREE completely different directions the second chapter can take depending on your choice at the end of Chapter One. Oh sure, you still have to go the same planets in the same order, but the greater narrative is shifted drastically depending on who you are working with and why. For once in this game do you actually feel like your actions have consequences and are not pre-determined with only slightly different dialogue. At several points I actually had to step back from my keyboard and THINK about which dialogue option to choose knowing that this may well indeed alter events and since it’s a MMO with no saves to fall back on – it’s all for reals. An amazing story with amazing plot twist and actual consequences to player choices that will keep you on the edge of your seat for each cut scene. That’s why the Imperial Agent is my Number One Best Class Storyline. If you want to find out more about these storylines you can find my Spoiler Free Summary page here that also has links to the far far less spoiler free reviews.